Hôtel Balladins Lyon / Bron Bron, Hotel France. Limited Time Offer! Balladins Tourotel Lyon Bron. 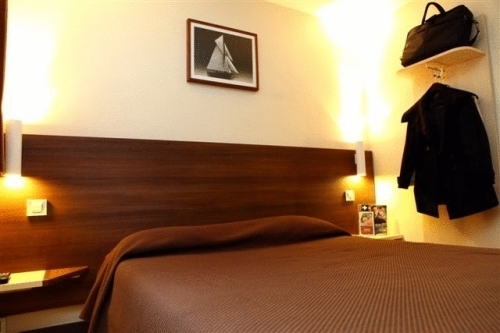 Hotel "Balladins Tourotel Lyon Bron" has received 2 stars. The accommodation is an excellent pied-a-terre from which to explore Bron. The airport is at close proximity. The total number of rooms featured is 50. The bedroom temperature is never too hot thanks to the relieving air conditioning. Guests are offered the option of taking part in soccer. The onsite restaurant serves visitors a tasty dinner. After a long day, visitors can have a drink at the lounge bar. In the morning, visitors can enjoy the accommodation's breakfast. Staying in touch with the rest of the world is made possible with free of charge Internet access.